Large, painted outdoor ads apparently are rare in New York. Out here, Hollywood entertainers and superstar athletes still vie for attention and prestige on immense outdoor advertisements but hardly any buildings have paintable sides. 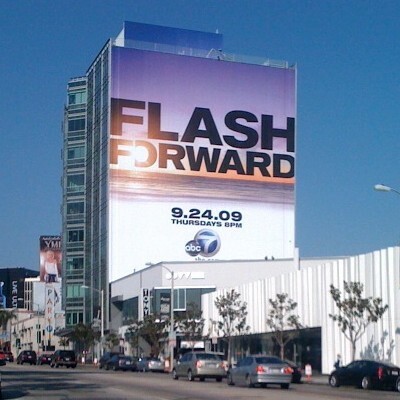 Although billboards on Sunset remain important, they’ve been upstaged by “supergraphics” made of plastic or vinyl that can be stretched across the side of a building. This entry was posted in Like Show Business, SF & Fantasy Art and tagged Batman, Irene Gallo, Tor.com by Mike Glyer. Bookmark the permalink. I’m more interested in the nitty-gritty of planing it out to scale. It would’t do if Batman’s head were taller that it was wide and twice the size it should be. Do you suppose Johnny Depp will play the lead role for the next lauch of the Batman franchise? No, not the Joker… I mean Batman.